There’s something to be said for pushing yourself beyond your comfort zone. For many artists, craftspeople and other creative professionals – let’s just call them creators – it can be incredibly daunting to launch, operate and/or grow a small business. Even just the terms “business” and “businessperson” tend to carry a lot of ugly baggage. While many creators are accustomed to regularly pushing the envelope of their own imaginations, a self-defeating attitude about the world of business can too easily obstruct their professional growth. I’ve been thinking a lot about my own comfort zones lately. I have never considered myself very athletic. All throughout school I was almost always the shortest kid in my class. As a result, I went out of my to avoid playing sports –- I always saw myself as more of an artsy, creator type. I did drama instead, wrote a satirical newsletter, played in a band –- pretty much anything and everything as long as a true physical challenge wasn’t involved. When left to my own devices, I’m not really a big fan of physical pain, discomfort and, you know, sweating. I’m also not so keen on trying new things that don’t feel immediately natural and intuitive. Extreme physical challenges are one of my fear-spheres, one the realms that lies beyond my immediate comfort zone. I bring this up because last weekend I took part in a two-day, 130-mile bike ride. While I’ve been a regular bike commuter for about four years, prior to my training for the MS Ride: Waves to Wine, the longest distance ride I had ever been on was about 33 miles, and that was pretty intense. I really jumped into the deep-end with this one. The first day alone, I rode nearly 80 miles, tackling over 4000 feet worth of elevation gain. 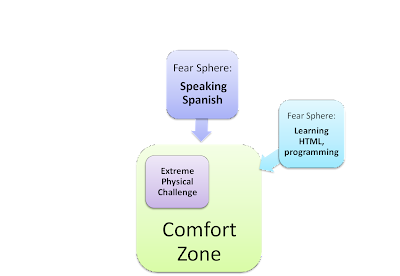 Here's a diagram of some of my own fear-spheres. The fear (of failure, discomfort, humiliation, etc.) that accompanies my perceived weaknesses serves to compress my comfort zone, rendering it unnecessarily limited in scope and depth. The Waves to Wine experience showed me that I’m actually stronger, both mentally and physically, than I gave myself credit for. There were several stretches during the ride where I wanted to quit, or at least stop pedaling and walk my bike up during an uphill section. But somehow I kept going. In part because I had support from my wife and teammates, but even more so because I had an inner dialogue with myself that persuaded me that while the actual experience of discomfort is fleeting, the feeling of accomplishment that comes from pushing past discomfort carries with you and energies you for a long time to come. I’m not saying that everyone should go out and buy a road bike or sign up to run a marathon –- it just so happens that for me, personally, that kind of extreme physical challenge was a major fear-sphere. 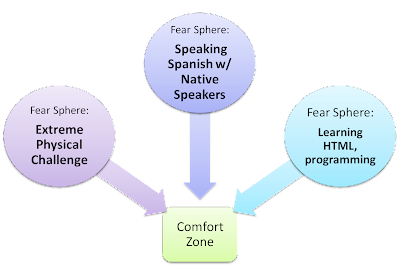 Strategically pushing myself to tackle new challenges serves a dual purpose: First, it enables me to incorporate a prior fear-sphere into my comfort zone, allowing my overall confidence to expand. It also renders my other fear-spheres significantly less daunting and more manageable. 1. Map out your Comfort Zone and brainstorm the Fear Spheres that lie beyond. Sit down for 15-20 minutes and come up with a list of activities that make you feel completely at east. This could be your craft, a favorite hobby, hanging out with friends, etc. Then brainstorm the realms that freak you out or make you feel uncomfortable, self-defeating, or embarrassed. For many this might include things like public speaking, talking about money, receiving negative feedback, etc. 2. Push yourself in ways seemingly unrelated to business or your craft. Try a new sport, musical instrument, language or type or free reading. But please, no underwater basket weaving. Flexing seemingly disparate muscle groups will build your overall confidence and tolerance for the discomfort and resistance that naturally accompanies the process of professional growth. 3. Ask for support and offer it to others. While comfort zones are highly personal and individualized, the process of expanding them almost always requires some form of external support. Ask your friends, family and colleagues for support and encouragement as you take on a new challenge – chances are they will eager to help however they can. Also consider mentoring someone pursuing something that already lies within your comfort zone. 4. Focus on the process, rather than the results. There's an old cliche that entrepreneurship is all about embracing failure – failure is good, they say. I think that’s a bit misleading. Failure itself is definitely not good. But being willing to fail in pursuit of true growth actually enables success. Some fear-spheres will simply prove to be more intractable than others, so the reward must come from the process of gradually chipping away at them, rather than some kind of instant gratification. Women Career Coaching is committed to our mission of “Women coaching women to create smart business strategies.” We will provide you with career coaching, leadership development and insights from women who have been leaders in the business community.